The students write their own lyrics using their Science book as a guide in groups of two. Each group needs to chose their own Science concept as I don't allow them to repeat. Once they have finished writing their song, they create their music and melody in Garageband (however, you could download the program called Audacity for free online or use Acid Xpress 7). Once they have their music created I send them into the "Recording Studio". 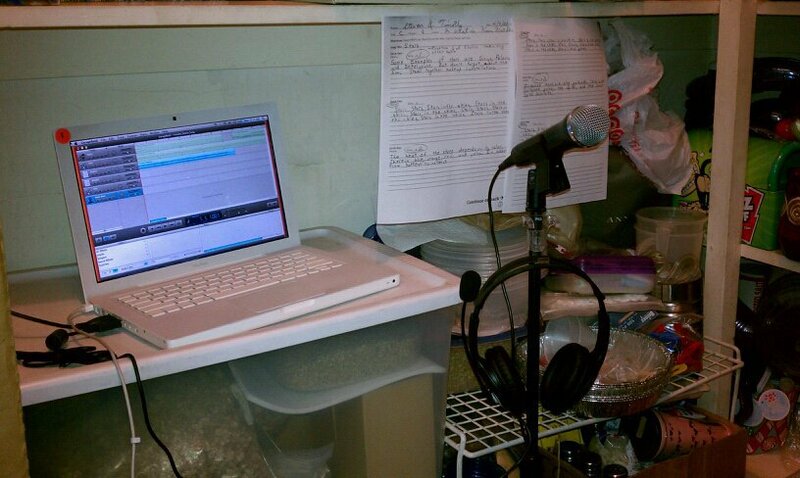 The "Recording Studio" all set-up. 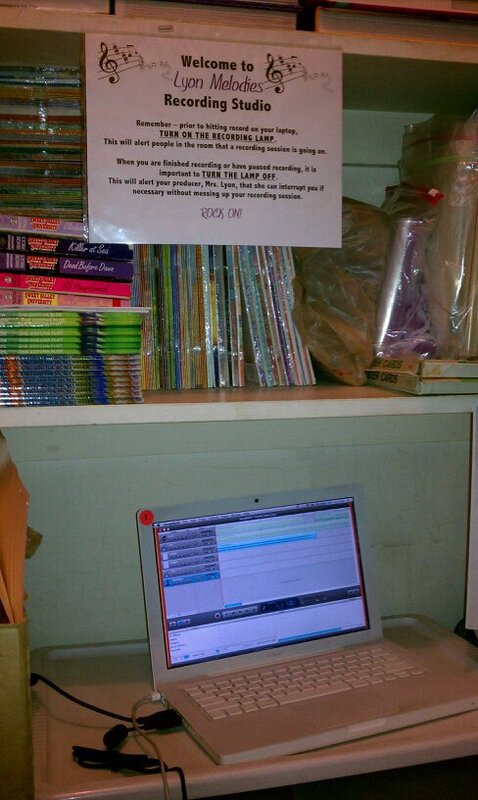 Now this is the fun part - I turn my closet into the recording studio. Now....I know what you are thinking. Students together....alone....in a closet. Yes. BUT I set-up a camera which is linked to my desktop so I can see them in real time. Works perfectly and I haven't had a problem. 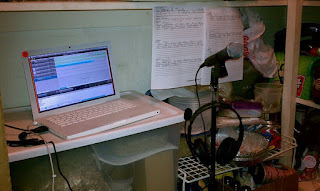 In the closet is a laptop with their music, headphones so they can hear their music while singing and my RockBand microphone stand and mic which is connected to the laptop to record their singing. 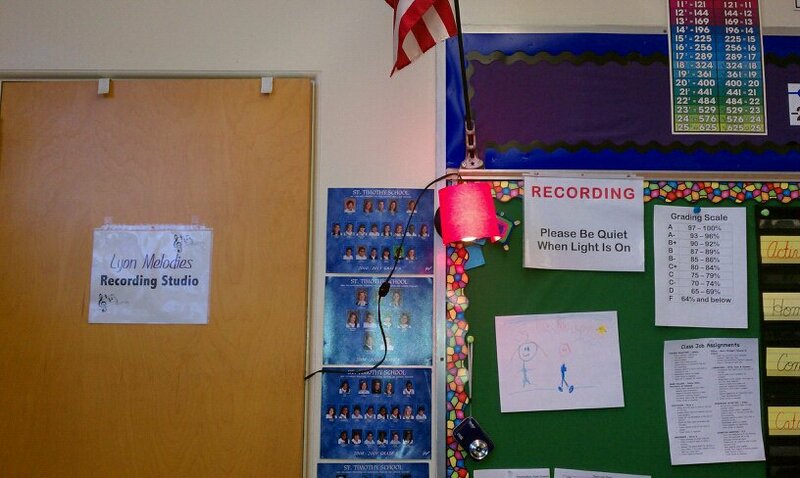 I have even rigged a light outside that has red paper strategically placed over it near the top of the door for them to switch on so the rest of the class knows when recording is going on. The red recording light outside the door. The kids absolutely adore this lesson and it gives them an opportunity to share what they have learned. As a gift, I record all the songs onto a CD and give it to the kids at the end of the year. As 2010 Teacher Appreciation Week begins, I wanted to take some time and thank some teachers who have made some type of impact in my life. This man was my eleventh grade Geometry teacher at Streamwood High School. I was not a very good math student.....at all. However, in his mind failure was not an option for me. Everyday he would give me a pass to come see him during his lunch hour (my study hall) and he would provide me with extra tutoring. He wasn't paid to do this. I remember him trying to eat his lunch while helping me. I may not have received an "A" in Geometry but he taught me a gift far greater than just math. I don't think I ever got a chance to say thank you to him. However, 15 years later I still remember his selfless act and hope that one day I'll make an impression upon a student like Mr. Wilkins did on me. I am lucky to work with an amazing staff at my school. Since there is only one teacher per grade, we don't have the luxury of sharing ideas within a grade level. However, we an amazing relationship with one another and support each other unlike any other group (within education and without) that I've ever worked with. No matter how bad of a day I'm having, I know that I can count on my colleagues to be there to pull me through. I'm blessed to be working with them! 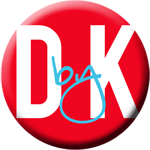 These are two forum boards that I visit often (especially during the summer when I have a bit more free time) and post questions and ideas and in return get some insightful responses from other educators. Again, this is a group that if you're having a bad day, you can go and find some comfort with these teachers. I've also been able to get some amazing ideas to bring back into the classroom from these boards. This is a group of educators who willingly share their time and ideas to help make us all better at the jobs we love to do. So I say thank you to all of you! If you have an opportunity this week to thank an educator in your life, I hope you'll join me in doing it. Until next time, I would like to thank all the teachers out there who work so tirelessly to make a difference in a child's life in one way or another.